Pope Francis held the relics of St. Peter during a mass at St. Peter’s Square Sunday morning, which celebrated the end of the church’s global Year of Faith. It was the first time since their discovery that the Catholic Church has displayed the relics, which were in a bronze display case. During the mass the bronze case was placed on an altar and opened to show the bone fragments inside (pictured here and video at BBC). Between 1939 and 1949, an archaeological team led by the Vatican discovered a complex of pagan mausoleums, now called the Vatican Necropolis; the Administrator of St. Peter’s, Monsignor Ludwig Kaas, was head of this excavation. In 1942, various skull and bone fragments were discovered with remnants of gold and purple cloth in a marble-lined repository, near some graffiti that read Petr[os] eni (“Peter is here’). 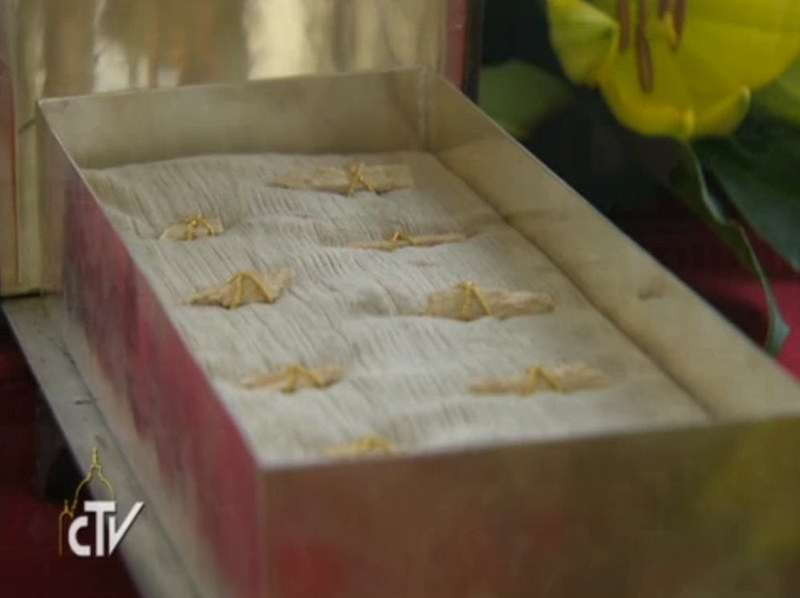 Monsignor Kaas, believing that these were the relics of St. Peter, kept their discovery a secret because he was worried about their safety, and stored them in a shoe box in a cupboard. After Kaas’s death in 1952, Professor Margherita Guarducci was chosen as his successor. 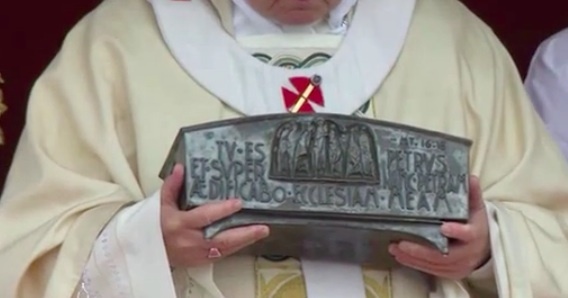 When Guarducci found the relics and saw the engraving, she told Pope Paul VI of her belief of their authenticity. Scientific analysis revealed that the bones belonged to a man who died in his sixties and was about 5’6” tall (though I haven’t been able to find what kind of testing was done). On June 26, 1968, Pope Paul VI announced that the relics of St. Peter had been “identified in a way which we can hold to be convincing.” In 1971, Paul VI was given an urn containing the relics, which were then stored in the private papal chapel. Before today, the bones were only shown for the pope’s private veneration every June 29th, for the feast of saints Peter and Paul. It sounds like the mystery will endure for archaeologists, but for the faithful these bones will remain St. Peter relics.